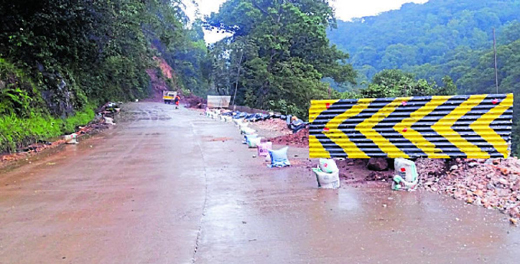 Mangaluru, Aug 21, 2018: Bleak Jodupala and nearby villages of Devarakolli and Monnangeri wear a deserted look as the residents have been evacuated following massive landslides and flash floods in the region. The houses and shops are locked while cattle and pet dogs have been roaming the streets in search of their owners. The police have placed barricades at Koinadu and entry is restricted further as a precautionary measure. Several people from nearby areas in the vicinity were seen requesting police personnel to allow them to visit their houses to look at the situation there. The police had a hard time in convincing the people about the possibility of further landslides in the region. Sheshappa Naik said that his family has left everything behind. All important documents and valuables are back at home. Now the family members fear about the valuables being looted by thieves. Sullia SI Madhava Koodlu said that about four people are believed to be stranded in Kammadi estate and NDRF personnel and fire and emergency service personnel have been deployed in the spot. Chandrashekhar from Monnangeri said that the entire village has been washed away. People from close to Jodupala, expressed their concern about their livestock and important documents which they have left behind. After availing permission, some people transported their cattle with the help of pick up vehicles. 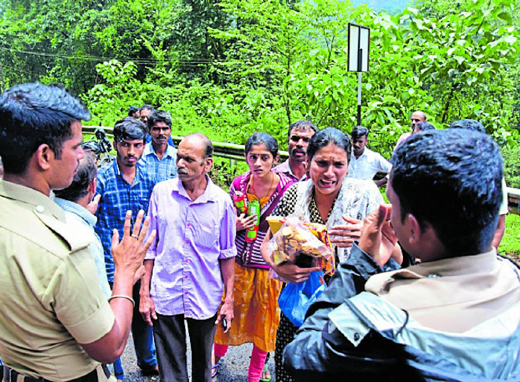 Of the 282 flood victims who were sheltered in Thekkila relief centre, 79 have moved to their relatives houses, industrial extension Officer Veerappa Gowda said. There are two more relief centres in Kallugundi and Sampaje. There are 46 schoolchildren in Thekkila centre, who were studying at schools from Jodupala, Madenadu and Devarakolli. Vimala from Jodupala said that road connectivity has been cut to her village in Kadematte. Huge trees have got stuck under the Koinadu bridge across Payaswini River near Sampaje. Volunteers are clearing the weeds and trees from the water. Residents of Kalmakaru are terrified as they have been facing nature’s fury. The Kadamakallu Gudda in Kalmakaru near Subrahmanya, situated on the other side of Jodupala village, collapsed. 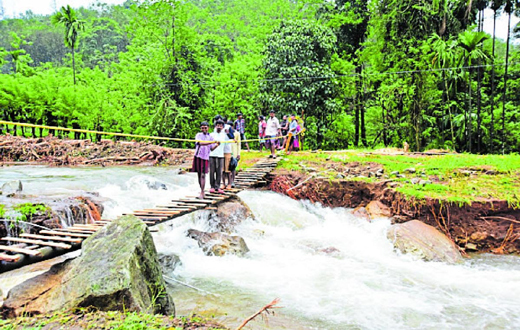 As a result, there was flash flood in Kadamakallu stream which has washed away a bridge in Mercara estate in Kadamakallu under Galibeedu Gram Panchayat in Kodagu district. The estate lies on the border between Dakshina Kannada and Kodagu districts. The floods have brought down huge trees, affecting the course of water in Kadamakallu stream. The tree logs were cleared by workers. Mercara Estate assistant manager Jobi said around 500 people, including 10 families of estate labourers, were affected. There are labourers from Assam, Guwahati, Tamil Nadu and Kerala, apart from those in the locality. A bridge situated in the 800-acre rubber and areca estate has been washed away. A makeshift bridge has been constructed by the workers to re-establish connection between the line houses and the estate. Agriculturist Narendra Bilimale said the overflowing river inundated acres of rubber and areca plantations. Damaged bridges are being repaired. Two vented dams at Shettykatti and Bayalukatti have been washed away, he said. A number of mini-bridges and footbridges have been devastated by the flash floods, he said.